Hestra Heated Ski Gloves & Mitts Review – F’ing Great! The Hestra name is not huge but those who know it know that it means quality. These Hestra heated ski gloves are handcrafted by the most experienced glove makers in Europe. These Hestra Heated Ski Gloves and Mitts are the only heated variety that you’ll find in the large Hestra collection of gloves. I had very high expectations for these Hestra gloves given the name brand and price but they easily lived up to it in my opinion. Hestra is a family run company founded in 1936 by by Martin Magnusson and is currently being operated by the 3rd and 4th generations of Magnusson’s. The name Hestra is actually the name of the town that the company was founded in, which is in the province of Smaland in Sweden and they have a flagship store in Stockholm. They aren’t a huge company but they produce a lot of gloves considering their size. As you can imagine they put a lot of emphasis on quality which really does show through with the product. All of the gloves they make are hand crafted using the finest leathers and materials. I was surprised to see just how many different types of gloves they make. 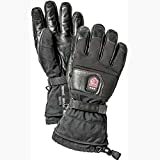 In addition to ski gloves they also make work gloves, golf gloves, cycling gloves and glove liners. I can honestly say that Hestra gloves are some of the finest gloves in the world and these heated gloves certainly live up to the name. The Hestra line of gloves are all made to fit snug to the skin which makes for a very comfortable feel. Whether you buy the gloves or the mitts you’re always going to want them to fit snug. The exterior shell is made of cow hide leather and Flextron nylon which makes for a soft and flexible feel for ultimate comfort and warmth. Speaking of comfort and warmth, the interior of the gloves are lined with a really soft polyester which makes them feel really nice against the skin while also providing warmth. The first thing I noticed when I tried them on was the way they moved with the hand. When you squeeze something or make a fist the gloves seem to move very naturally with the hand which feels awesome especially after a long day on the slopes. Since these gloves are heated they don’t require a lot of bulky insulation which makes for really good dexterity so that you don’t have to take them off to make adjustments to your gear. There are three heat settings and they get really hot, especially on the highest setting. I found that the lowest setting was more than enough for my ski day which was about 14 degrees Fahrenheit or -10 Celsius. The only complaint I have is that they don’t work with touchscreens but that is not too important. I’m giving them a 20/20 for comfort and a 20/20 for warmth. Since these gloves are made of premium leather and nylon they did really well in this category. They stand up really well to wet snow or heavy rain but I would say that they aren’t quite perfect. Since they have so much leather on the exterior they eventually start to absorb water if the conditions are really wet. The leather absorbs water and becomes slightly heavy and soggy which makes them a little less comfortable. With that being said they still kept the water out and my hands were 100% dry so they did their job. Given these discoveries I’m rating them a 19/20 in this category. As I said in the overview, the Hestra name stands for a lot, especially when it comes to quality. Every pair of gloves they produce is made by hand using only the finest materials. With almost eight decades in the business of making gloves they certainly know how to make a high end garment and that’s exactly what these are. Since leather is a natural product and not man made it does come with some inconsistencies. Some sections are thicker than others and you might see some imperfections or even scars in some areas. This doesn’t affect the quality of Hestra gloves in the slightest because the glove maker simply selects the ideal piece of leather for the particular section of the glove he or she is working on. If the glove maker is crafting a pair of golf gloves he or she will select a thin piece of leather because you ant that touch and sensitivity that thin leather will give you. If they’re making a warm ski glove that needs to be durable they’ll select a nice thick piece that will stand up to a lot of heavy use. Upon inspection you can actually see the quality in these gloves. The stitching is tight and the seems are straight and strong. You won’t find a glove that is better quality so I’m giving these a 20/20 in this category. These gloves come with two lithium-ion rechargeable batteries that held a charge for a good amount of time under heavy use. There are three settings of heat and here are the results. I’ve yet to find a pair of gloves that last longer than 2.5 hours on the highest setting so again, Hestra lives up to it’s reputation. I found that these gloves fit pretty true to size but it’s important that you don’t get them too big because they work best when they fit snug. If you’re between sizes I would recommend going a size down just to be safe. Worst case scenario you can exchange them for the right size no questions asked. Have a look at our sizing guide if you’re not sure. Additionally you can check out the Hestra Sizing Guide on their website. As you can tell I’m really fond of these gloves. Not only these gloves but I’m actually a huge fan of all Hestra gloves and the company as well. I just love the fact that it’s a small family company that makes a very high end product and takes pride in it. That is how it should be. Whether you go for the mitts or the gloves you really can’t go wrong but there are some obvious differences. The mitts are slightly warmer so if you’re really concerned about warmth you might want to lean towards the mitts. If dexterity is more of a priority to you than you’ll be happier with the gloves and I think you’ll find them plenty warm enough for your needs. The warranty is not going to be a problem because Hestra is known to be very easy to deal with on exchanges or returns especially when purchased through Amazon. I’m going to have a hard time finding a pair of gloves that I like more than these Hestra heated ski gloves. Thanks for your review on all the best heated gloves. I have a question: have you come across non-rechargeable battery heated gloves? The reason I ask is that my girlfriend has Raynauds and we are heading to Mongolia for 10 days on horseback in the winter. Staying in yurts with the nomadic Mongolians, we shall have no way to plug in rechargeable batteries. Thought I’d send you this challenge as you seem to have done your homework really well on the heated glove subject. That’s a tough one. The original heated gloves actually were made with 9 volt batteries. Unfortunately they never really worked that well and the heated gloves industry didn’t really take off until lithium ion batteries became common. I’ve done some digging and I can’t really find any of those gloves for you and eve if I could I don’t think they’d be very good anyway. Since your girlfriend has Raynauds I’m sure she’s already tried all sorts of the heat packs. I personally am not a huge fan of them but another option for her would be the Zippo hand warmer. It uses lighter fuel and one fill lasts up to 12 hours. They generate a lot of heat and one bottle of lighter fuel goes a long way. Might be a good option for her. Hope that helps. Hi, I am a severe Raynauds sufferer but do a lot of all year round mountain biking in the UK. It has got so bad I am considering a purchase of the Hestra’s or Lucents. Just wondering what were your views regarding glove choice for mountain biking. Also the need for a back up battery or not. I would be a size 11 according to Hestra’s website. These are pretty difficult to source so although I would be spending a load of money I will have quite limited choice. Both the Hestra and the Lucent would be great for mountain biking because they both offer relatively good dexterity. If I had to choose I would say that you should go for the Lucent simply because they’re slightly less bulky but they offer the same amount of heat. As for a second battery, that would only be necessary if you ever need them on high heat for more than 2.5 hours. I would guess that you could most likely dial down the heat to medium for part of the ride which would stretch out the battery life a great deal. Also if you can handle the power level on low you’ll get up to 8 hours of heat which is a long time. I’m quite interested in the Hestra Power Heater gloves but a mention on the internet that the heating elements are only coiled around the fingers, but not around the thumb. Can you conform whether this comment is correct or not? I’m somewhat skeptical knowing that not all internet information is accurate. Thanks. Sorry for the late reply. No that is not correct. The Hestra Power Heater gloves have heating elements around the thumb as well. There is a lot of wrong information out there but I know 100% without a doubt that they heat the thumb as well. Most reviews do not make clear if the heated gloves come with a required dedicated charger or a USB connector. can You list a few highly rated for warmth that do employ USB connections? Many thanks for excellent, informative reviews.